When changing a watch battery, the actual act is fairly simple, but there are many things you need to be aware of beforehand to keep from damaging the watch movement. 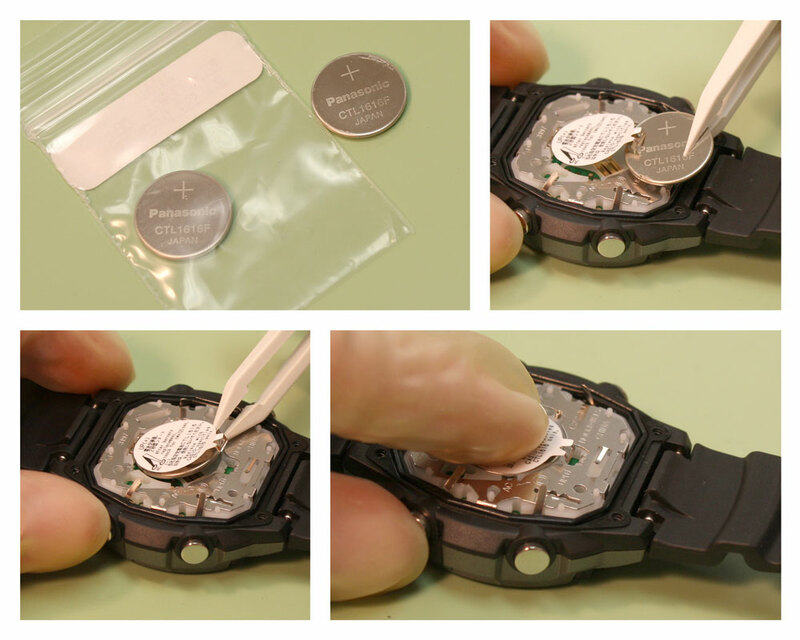 If your watch is powered by a rechargeable battery, there is a fairly common method used to hold these batteries in place that is similar to how Lithium batteries are held in watch movements. 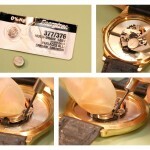 For help opening your watch case, check out this article. Disclaimer: These steps will not work for more complicated rechargeable battery driven movements or Eco-drive rechargeable cells. If you open your watch back and the watch movement is not readily accessible, leave this job to your professional watchmaker. Before even thinking about opening a watch case that is powered by a rechargeable battery to change the battery, you should always leave the watch out in the sunlight to make sure the battery is actually dead and doesn’t just need to be charged. For optimal charging times and instructions, check your watch’s user manual. 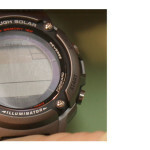 If you no longer have the manual, you can find watch model recharging information by searching the model number online. Be sure to check the crystal of the watch as well: if the crystal is very dirty or heavily scratched and chipped, your battery might be able to charge because the solar panel in the watch face might not be getting enough light. Once you have opened the watch case back and before you touch any part of the movement, you should put plastic finger cots on your fingers that might touch the watch movement. We recommend doing this because any dirt, oils or grease on your fingers can get on the movement and damage the inner workings of the watch if you touch it with your bare fingers. These finger cots will keep that oil from transferring to the watch. Once you have removed the back, you may encounter a wide rubber or plastic gasket across the movement. When your fingers are protected with finger cots, remove it and set it aside so you can access the battery. 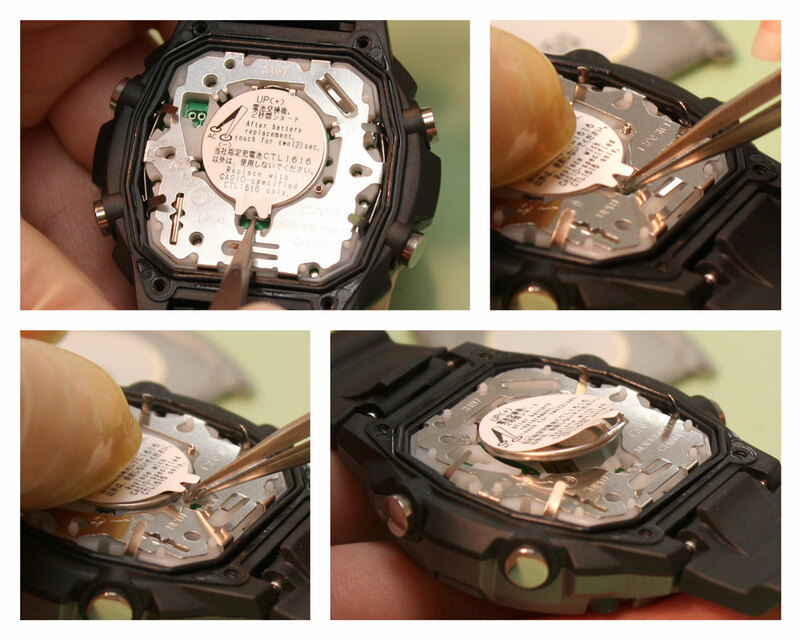 If you do not see anything covering the watch movement, you can ignore this step. NOTE: You won’t be able to see the number on the battery before you attempt to remove it because the latch strap will cover most or all of the battery. Be sure to remove the battery carefully so you don’t lose it before you can find the replacement number. At this point, you will be able to see the battery. It will be held in place with a large strap that is a little like a cell strap except that it is larger and held partially under the battery. There may also be a sticker on the battery and strap with instructions for changing it. Watch movements are very delicate and you should use the utmost caution when working with them to avoid damaging or moving their precision parts. Be particularly cautious of springs that stick out. Find where the strap locks into place. There will be a small opening in the piece that holds the latch down, take your non-magnetic tweezers and grip the metal latch piece in the opening. Carefully push the metal latch down with your tweezers before pulling them out toward you to release the metal latch. Now that the strap is open, take your plastic tweezers and grip the battery to remove it. You may need your non-magnetic tweezers to slip the battery out of its slot before you can grip it with your plastic tweezers and remove it completely. Examine the battery and find the replacement number on it. If the battery number starts with a “CTL” it is definitely a rechargeable battery. Set the old battery aside, in case you need it again before you are done working on the watch. Once you have the right size replacement battery, take it out of the package and pick it up with the plastic tweezers. Make sure that the positive side of the battery with the engraved number is facing upwards. Carefully lift up the latch strap and slide the new battery under it and into the battery slot with the positive side facing upwards. When the battery is under the strap you may have to use your fingers to push it into place. 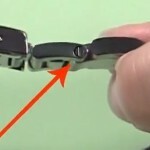 Then, take your non-magnetic tweezers again and grip the tab of the latch strap that locks into place in the movement. Holding the movement steady and in place with your free hand, reverse what you did to remove the latch – push it down and then back toward the battery until it slips into place. Now that the latch strap is back in place, you need to restart the movement with the new battery. Take your non-magnetic tweezers and put one pointed tip in the hole marked as a negative charge. Place the other tip of your tweezers in the AC port in the movement. 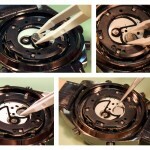 Once both tips of the tweezers are in contact with the movement ports your watch should be running again. Next, if your watch has a rubber or plastic movement cover or gasket, you can replace it over the movement to keep it cushioned away from the metal back now. 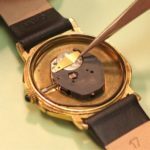 Replace the watch case back, for information on How to Close Your Watch Back, check out this article. Once the back has been replaced, you should set the time and then place the watch face up under natural light for an hour to fully charge. 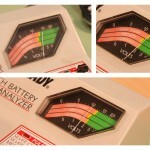 While the battery is charging be sure to discard or recycle the old battery, as they can be toxic and dangerous.